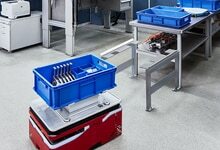 Automated flexibility for mobile vehicles and carts: Our modular solutions portfolio for mobile platforms now makes it possible to implement line guidance, navigation, positioning, environmental recognition, security and load handling with ease From small AGVs or AGCs (automated guided carts) to specialized AGVs, the sensor solutions from SICK cover the entire spectrum of automated guided vehicles. 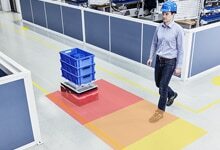 This ranges from cost-effective solutions such as line guidance and simple collision avoidance to fully-certified safety solutions and integrated contour localization, which can be scaled and adapted to the individual application case of your automated guided vehicle system with the help of modules. Mobile platforms are moving automatically or autonomously between different points in the production or logistics environment. To make sure that they find their way diverse sensor solutions for navigation and positioning are necessary, which serve to localize and navigate mobile platforms. During transportation mobile platforms have to be able to recognize and perceive their environment. This prevents collisions with objects or people, and ensures safe and reliable process operations. A core function of mobile platforms is the transportation of goods. 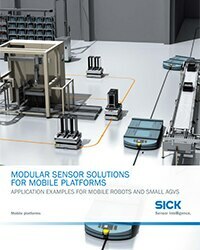 SICK offers a wide solutions portfolio for detecting, positioning and identifying goods. Mobile material transport systems are found in almost every industrial production area.